We go on-air in less than 100 hours is an alarming statement when the studio and control room in question contain no technical equipment whatsoever. But this was the situation that we faced upon arrival at the new Local TV channel in Manchester for the first time as we began to unload the van late on a Thursday afternoon at the end of May, we knew that the station had to go live on Sunday evening, just three days later. And not only did the new channel plan to launch with a live studio show, but it would also have to remain on-air with its own transmission output continuously after that. We have worked on projects with quick turnarounds before, but the speed and scale of this one were quite breath-taking. Of course, the story really began much earlier than that. Thats Media have already launched local channels in Portsmouth and Oxford, although they had only relatively recently taken responsibility for the former Your TV licence in Manchester. We, aQ Broadcast, have a great deal of experience of other local launches, including Mustard TV in Norwich, Latest TV in Brighton, Bay TV in Liverpool and Big Centre TV (BCTV) in Birmingham. Thats and aQ had already worked together at Thats Solent when it launched in late 2014, so it was an obvious step to consider collaborating again on the Thats Manchester project. But there were some significant targets to meet, including a launch date of 31st May defined by Ofcom as a condition of the transition from Your TV to Thats TV and the requirement for a single technical solution to meet the entire needs of the whole new station. 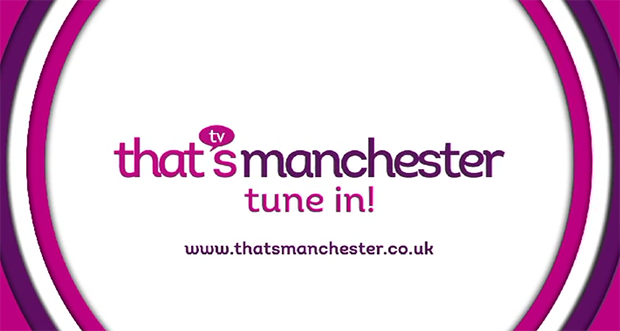 Discussions actually began about the Manchester launch in late April, but many factors including having to locate and adapt suitable studio space meant that the system couldnt be installed until immediately before the on-air deadline. With such a tight turnaround, it was clear that the only viable approach would be for us to build, configure and test a complete system off-site in a wheeled rack, and then simply roll it into location, plug it in and then turn it on. We had used the same method to deliver a system to BCTV successfully within a short timescale earlier this year, but the technical requirements for this new project were rather more complex. ¢ Shared storage for recorded content, for finished pieces ready to be played out and for use as a working area, with access from any networked workstation. ¢ Production capability for the studio, handling both live and pre-recorded shows. This should include video and audio mixing, CG graphics (i.e. lower-third captions), still-store handling, internal clip playback and recording, all using material on the shared Store. ¢ Video Server functionality, providing conventional clip recording and playback (also to/from the shared Store), primarily for transmission play-out purposes i.e. playing sequences of recorded content. ¢ Branding graphics handling, allowing station logo, clock, ticker and sidebar to be inserted, managed and controlled on the final video output. Elements such as the logo and clock should be controlled as part of the transmission schedule, whilst other elements, such as the content of a ticker, would be managed by a producer. ¢ Down-conversion of the final video output signal to Standard Definition suitable for connection to the transmission encoder. ¢ Newsroom scripting and rundown handling to allow news and other programs to be prepared and produced by the editorial team, including integrated prompting. ¢ Production Automation, providing studio automation for live production, including scheduling and control of video clip, CG and stills playout, based on automation event information entered into the current running order. ¢ Transmission Automation for the main program output, including the ability to switch between automatic, sequenced playback and live studio production. This varied functionality involves a number of different technologies and we are probably the only British company able to offer our own range of software and hardware components as a single solution for this type of environment. Although we have already worked with a number of other LTV stations, this launch is the first where we have provided elements from across our whole product range to fulfil all of the technical requirements i.e. where no other equipment is involved. 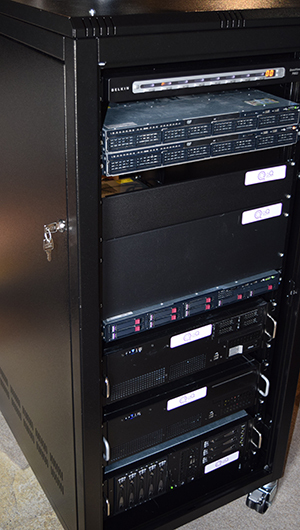 The pre-configured rack that we delivered contained an aVS (our Video Server, providing 5 TB of shared storage), a primary aPS (our Production Suite, supporting all live production and transmission playout), a backup aPS (for additional resilience and flexibility) and a QSeries Database Server, supporting both QNews (our newsroom computer system including news automation) and QTx (our transmission automation software). We also provided a complete gallery solution, consisting primarily of three standard PC workstations one for production control and monitoring, one for news automation control and one shared for use by the prompt operator or producer and for monitoring the transmission schedule. Whilst it obviously took some time beforehand to install and configure the various servers within the rack, once on-site it was simply a case of plugging in mains power, networking, video from the cameras and audio from the studio, and connecting the rack output directly to the transmission encoder, in order for the whole system to become fully operational. As the functionality is designed to be controlled from multiple instances of a user-configurable interface, it was straightforward to set up the gallery workstations, along with other PCs in the newsroom, to meet the teams operational requirements. And the remote access capabilities built into the system meant that we could continue to monitor, maintain and reconfigure the functionality even after we had left the site. There are many benefits from adopting a single technical solution, including having a single point of technical support and removing any of the issues normally associated with interfacing between equipment from different manufacturers. But the main advantage comes from the fully-integrated workflow, which makes operation of the system very efficient and effective. In this case, the single shared Store means that media never has to be moved in order to be used for different purposes, the support for a wide range of formats means that clips dont need to be transcoded before use and the fact that transmission originates from a local server means that content doesnt have to be uploaded before being transmitted. It is also significant that the newsroom and transmission functionality are controlled via the same software, as it makes it extremely quick and simple for users to share content between both live and automated playback. 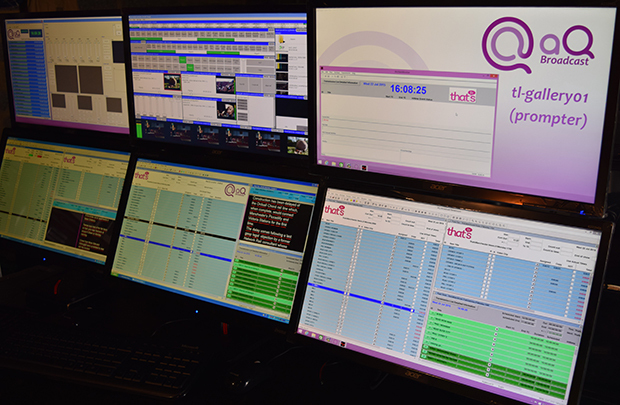 Whilst the approach of using a pre-configured rack made the physical site installation extremely quick, it was also crucial to have this very fast and flexible workflow available otherwise it wouldnt have been possible to train the team within the time available nor to sustain the continuous on-air operation required after the launch. With the system delivered on Thursday afternoon, and having completed installation and testing on the Friday, the first studio pre-record took place on Saturday morning. Rehearsals continued during Saturday afternoon and Sunday, along with final configuration changes. The first live news programme went out successfully, and on schedule, on the evening of 31st May and the station has been on-air ever since thus proving that it is possible, if not perhaps recommended, to get a new station live within just three days. Dan Cass, Thats TVs Chief Executive, was happy with the result. We are very pleased that we chose the fully-integrated aQ Broadcast system for Thats Manchester he said. aQ provides us with the integrated scripting, production and automation functionality that we require to deliver our substantial mix of live and original programming for Greater Manchester. The system is intelligent, robust and intuitive. Cass added weve also been really pleased with the support from the team and their openness to adding specific features to meet our own particular requests." aQ is currently in the process of building a similar system for another channel. Thats Lancashire, to be based in Preston, is expected to launch later this summer, although we are all hoping to be on-site slightly earlier this time!